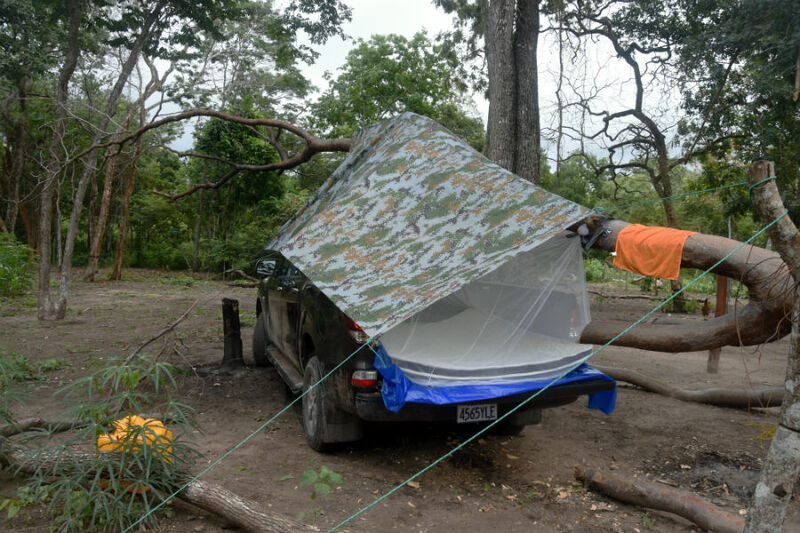 The Ultimate Bolivian Question – Tent or Tarp Hammock? I am often asked which is better a tent or a hammock with a tarp. There is no straight answer to this really and it depends where you are going to camp out. There are pros and cons with each one and things to consider. Tents need pegs and these mean that your backpacks have to go in the hold. You won’t be allowed on to most flights with your backpack as cabin luggage and so thus slows you down as you have to recover luggage at your destination. Tent poles are cumbersome to pack and can break (although rarely, I broke one this week). You can get one-person tents with short poles 30 cm is about the shortest. Cut your own tent pegs in the jungle. Metal pegs are generally too short to get through all the leaves and soft earth in a forest. You are better to cut 1ft long pegs made from branches of nearby trees and hammer them in. You with be dryer and if the wind gets up you will be pleased that you did. The branches will soon grow back or you can cut from a fallen tree. Hammocks by contrast fit into backpacks easily and the tarp is useful as a storm shelter if you keep it at the top of your pack it also is useful to keep everything under it dry. Tents are warmer if you are going into the mountains this is a better bet as you will find trees few and far between. Tents can be very hot in the tropics and you do get a lot of condensation. The beach tents / pop-up tents will let you down in heavy rain. Go for a two-layer tent. They are cooler on hot nights and in the desert, you can leave the fly off for a really cool sleep watching the stars. In a rain storm they will probably all let in a small amount of water but not enough to be problem. Rainfall in the tropics and flash floods mean that you are likely to be dryer in a hammock and getting off the ground and away from insects is a good idea. Some people worry about snakes getting in a hammock but I have never heard of this actually happening. It is a good idea to bang shoes out and check beds and sleeping bags for insects and animals before getting in. This needs to become a habit. Spiders particularly will nest in shoes or boots if left outside. Flash floods. You are safer if hiking a river bed in a hammock and tarp. A rain storm on a mountain far away can dump its contents into your river very quickly and water levels can rise a metre or more in minutes. Take care to pitch on high ground. You may have seen on the website that I use a tarp and mosquito net in the back of my BT50. This takes almost no effort to put up and gives me a flat level bug free night sleep. I think that a small 2-person tent would also fit in here, but I like the setup that I have. Depending on what you go for the cost is about the same. A 3×3 metre tarp will cost about £30 and a hammock with built in mosquito net is about the same £30 or so. I recommend tree straps which makes putting the tarp up and down much quicker. You can get these from about £10. A lightweight tent with a mosquito mesh and a fly sheet will cost about £70 for something waterproof. Remember you can just use a bivy bag and sleep under the stars. Look for a flat area away from insects and safe from flash floods. Also sleeping bag liners are good instead of a full sleeping bag for hot areas.